Regional press photographers have been shortlisted in a competition celebrating pictures of royalty taken in the past year. As reported by HTFP in April, the News Media Association has launched its inaugural Royal Rota photography competition – with photographers invited to submit their best pictures of royal engagements from the past year. Three photographers have been nominated for Best Regional/Local Newspaper Rota Photo category. 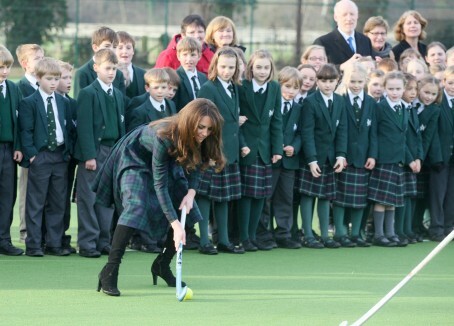 Adam Fairbrother, of the Lynn News, has been shortlisted for his photo of the Duchess of Cambridge at Princess Charlotte’s Christening at Sandringham, while a picture by Phillip Cannings for the Newbury Weekly News of the Duchess playing hockey at her old school, pictured below, also made the cut. Gary Longbottom’s picture for the Yorkshire Post of the Prince of Wales visiting a cheese factory rounds off the shortlist. The shortlist will now be judged by a panel of industry experts to select the winners, while a public vote to find an overall winner featured other regional press contenders. Perhaps unsurprisingly given their proximity to Windsor Castle, photographers working for newspapers in Berkshire feature heavily among the regional contingent of nominations. The Slough and Windsor Express scored four nominations in the overall public vote – including two for Ian Longthorne and one each for Matthew Phillips and Nick Parford. Mike Swift, of the Windsor Observer, had two pictures of The Queen’s 90th birthday celebrations shortlisted, while photos taken for regional dailies during royal visits to their patches also feature in the shortlist. Frank Dwyer’s photo for York daily The Press of Prince Charles visiting flood victims in Stamford Bridge, East Riding of Yorkshire, is nominated, as is a photo submitted by James Bass, of the Eastern Daily Press, in which the heir to the throne pulls a pint in a Norfolk pub. A photo by Mark Waugh for the Manchester Evening News of Princes William and Harry at a Veterans’ village also made the cut, as did Allan Hutchings’ picture for The News, Portsmouth, of the Duchess of Cambridge sailing. Prizes are up for grabs in four categories – National Newspaper Rota Photo of the Year, Regional/Local Newspaper Rota Photo of the Year, Rota Picture Agency Rota Photo of the Year and Overall Rota Photo of the Year. Come on HTFP – let’s see some of these photographs.